Former SLIPKNOT member Donnie Steele makes a guest appearance on "Waiting (For The End Of Man)", the debut album from the Des Moines, Iowa five-piece hard rock/heavy metal/groove metal band MURDER EARTH. The CD was recorded by Griffin Landa at The Establishment Recording in Des Moines. 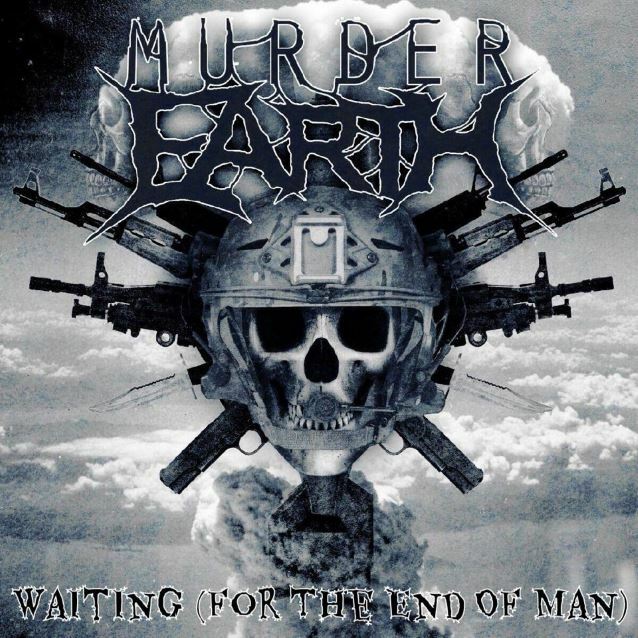 MURDER EARTH's lineup consists of Ben Murphy (also of HANGOVER, ex-BARTYR IN BLOOD, ex-THE FALLEN) on vocals, Tim "Dominic" Flor (ex-DREDGE, ex-PAINFACE, ex-PYGWALK, ex-SHEDD) on rhythm guitar, Jim Stockham (ex-DAWN OF DESTRUCTION, ex-FACECAGE) on lead/rhythm guitar, Rick Stuber (ex-ALL THAT CRAWLS, ex-NOTHING, ex-PYGWALK, ex-TRIPWIRE, ex-VICE GRIP THROTTLE) on bass, and Jared Albertson (ex-ABSOLUTE POWER, ex-CANNOT JUSTIFY, ex-MARS ON FIRE) on drums. Jim doesn't appear on the album, having joined MURDER EARTH after the departure of previous lead/rhythm guitarist Ryan Thornton (ex-CALOUS, ex-NOTHING, ex-PYGWALK). Steele stepped in on lead guitar to finish the recording of "Waiting (For The End Of Man)" after Thornton's exit. SLIPKNOT's original guitar player, Steele returned to play bass for the band for a couple of years after the Corey Taylor-fronted outfit resumed touring in 2011 following the death of Paul Gray. For more information on MURDER EATH, visit the band's Facebook page.